pain relief or hospital stuff. Plan for this day to be a turning point in your journey. Delivered retreat style, there is time for you to reflect and reconnect with what matters most to you. Its relationship focussed - so great for your couple relationship and it includes a man-to-man Dads only time too. 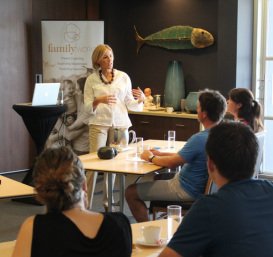 It was a small group that was very relaxed and helped us bring our focus on to parenting. One of the most useful things that I took away from the Masterclass was the idea of "thriving not just surviving”. I had been doing a lot of preparation with the aim for a natural birth… but we hadn't really done as much work on this from a parenting perspective… Now when we meet a couple having their first baby we always tell them positive stories and how much they will love being parents. What was useful about the Masterclass? Thinking about the personality types and looking at what sort of parenting styles and personality types our parents are was very useful to (dad) and got him talking a lot about his parents and the sort of parent he wanted to be. ​Babies of the Masterclass graduates. Your course really prepared us to get ready to fall in love with our baby and made us feel that by doing this and providing a safe, secure loving environment was one of the most important things we could do for his development. Sharon thank you so much for being a life saver! After doing your Expectant Masterclass I knew that if down the track once our baby arrived I needed further guidance that I would be contacting you. Sure enough, 11 weeks in to the birth of our first child Tasma, it was time to call you. Tasma's sleep was OK but her cat naps during the day were exhausting and I knew she needed to learn to self settle I just didn't know how best to go about it. After a one hour phone consult with you I had a pad full of notes and great ideas. Then your follow up summary was so precise and the steps so easy and left no room for confusion. You obviously know babies inside and out and your are so easy to communicate with. Tasma is now doing 2-3 hour sleeps in the day, settling herself to sleep (saves me sitting with her for hours! ), resettling and to top that all off, she is sleeping in her own cot in her own room! Last night was the first night Grant and I had our room back and we were so relieved and had time to communicate and reconnect, so important for a happy family. So Sharon, thank you for putting a smile on everyone's faces in this house! Lauren.